Beautiful as a wall hanging, indoor or outdoor. 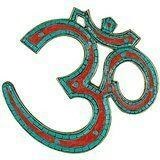 Om is the universal sound of the earth. This is Handcarved and hand painted. This is in Large size and Gorgeous. Handcrafted from a single piece of brass & turquoise hand work done and painted , on the Rural India. The OM sign is the symbol of divine and all encompassing consciousness in Hinduism, and Buddhism. The sound, when pronounced, is used in YOGA and Meditation for it's vibrational energy. This OM is surrounded by the SUN or "golden Energy". " When my soul and core are engaged, light is produced" Great decor , yoga, meditation piece, or gift. Size : 8 Inches Height X 8.5 Inches wide. Weight : 500 Grams . Material : Brass, With Turquoise and other coral stone Handwork.